Baselayer Technology has reengineered its RunSmart infrastructure management software using a microservices-based architecture. The redesign aims to address the broader infrastructure management market beyond datacenters. Its core datacenter infrastructure management (DCIM) platform now facilitates increased data aggregation and integration, has more customizable dashboards and features improved analysis and automation capabilities, including by third-party systems. A recent white paper, written by 451 Research, explores the new technology in detail. 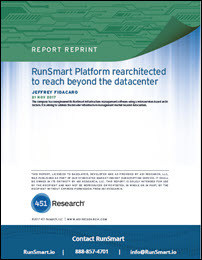 Work on the new RunSmart architecture began before Baselayer decoupled its prefabricated modular datacenter (PFM) and software businesses in 2017. The ongoing development has resulted in a platform that is more open, leverages dynamic APIs to improve data integration, and is readily customizable by users. The company’s vision and long-term plan is for RunSmart to reach beyond the datacenter, and become an enterprise-class IoT platform that integrates and orchestrates an extensive set of data sources.